War has raged across the borders of England and Scotland for years now. King David III of Scotland has captured and garrisoned Warkworth Castle with his trusted friend, Archibald, 3rd Earl of Douglas. You, Henry Percy, Earl of Northumberland have been tasked with retaking Warkworth Castle and securing the northern border. Douglas, that snake, has fortified the castle and has prepared for your assault. You must act wisely and quickly to take the castle. Once secured, His Majesty has ordered you to raise funds, equipment and provisions to be used in the coming campaign against the Scotts. 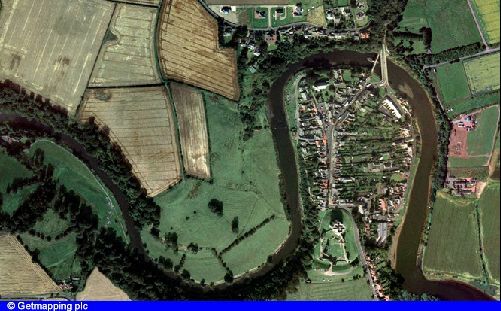 Warkworth’s bridge and river crossing are of major strategic importance and are key components in His Majesty’s invasion strategy. The Scotts know well the vital strategic importance of Warkworth and will stop at nothing to maintain their grip on the castle. His majesty has given you, Lord Percy, the office of Warden of the Northern Marches and possession of Warkworth Castle. It is your duty to secure the northern border with Scotland. This is a ‘cede’ scenario where you must take the castle and then defend it against counter attack while you achieve your economic goals. This scenario is designed for players of average playing ability. The scenario is fictional based on historic places characters and events. I attempted to faithfully recreate Warkworth Castle following the ground plan as closely as I could. As always, I hope you have as much fun playing this scenario as I have had creating it. Occupying an area if nearly six acres, the castle consists of three main sections. The Outer Bailey, the Inner Bailey and the Keep all had specific purposes and house structures that would have been necessary for daily life inside the castle walls. The Outer Bailey is roughly square in shape and is in the southern end of the castle. A deep moat carved into the peninsula defends the Outer Bailey, and a draw bridge would have provided entry to the main gatehouse. In addition to the impressive gatehouse, the Outer Bailey is protected by two towers (the octagonal Carrickfergus Tower to the west and the square shaped Montague Tower to the east). Within the walls of the Outer Bailey were a chapel, stables, a well, a great hall and the Collegiate Church. A tower adorned with a lion (Percy family crest) provided entry into the great hall. A tunnel under the foundations of the Collegiate Church provided the main access to the Inner Bailey. The Inner Bailey is triangular shaped. It is bordered to the south by the Collegiate Church and to the east and west by curtain walls. The Inner Bailey housea the brewery and laundry. The magnificent, cross-shaped Keep was built on the medieval motte or mound at the northernmost part of the castle which dominates the village of Warkworth. Rising to the height of three stories, the Keep is basically a smaller castle within the larger structure. The Keep contains a hall, chapel, kitchen, pantry and various chambers. Crowning the Keep, a central watchtower provides views of great distances for safety. Another notable feature of the Keep is a central light well that provides daylight to even some of the innermost rooms of the castle. The light well also provided a system for collecting rain water to flush the latrines. Today, the castle is owned by English Heritage and open to the public most of the year. The castle has been featured in many movies including Disney’s A Knight in Camelot and various other productions. Glad to see another one from yah Duke, review coming sooner or later. It's the weekend so I have time for some Strongholding. I'll play the map and give you some feedback. I was greatly relieved when the cede triggered. I like the look of this map and I have already downloaded and will play it tonight. Very good to see all the old players and designers still playing maps and. Quick edit your comment! Don't post any spoilers. I'm sure DoY won't apprecitate that. I played the seige part of the scenario and ran a bit of the economy. Great map so far, I'll maybe get to play the rest soon if I get a few more exams out of the way. I didn't damage the castle too much whilst seiging it. Not too many map designers can truly pull off something of this caliber, the pure craftsmanship DoY possesses shines through every rock and stone in this piece of work. Oh where to begin? The defense is riveting to the final year, and allow me to say, I've never had so many troops at my disposal and felt insecure, until I played this map. Two signposts kept the player on his/her toes, with both the backside of the castle and the front having their strengths and weaknesses, personally I preferred the Snake attacking the front, but only because most of my crossbowmen were there. 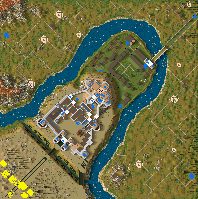 The whole map allowed for customization of the defenses, and I loved every minute of it. This is probably one of the best maps I've ever played, the 5 is justly given and deserved. Whoever doesn't download this map is missing a great deal of quality content. This map had its rough spots in terms of balance, but in the end you have to look at the whole thing and the difficulty you played on. After tenderly playing normal and getting my arse kicked in the last stages I decided to play on easy instead, and looking back on it, it was kinda easy. If easy is easy, then normal must be normal and hard must be hard etc, that's all I need to give balance a 5. Also it was a nice break from playing all those trap oriented maps, one I'm actually making lol. Usually I don't give historic maps a 5 on creativity, so let me try and justify this, if not to myself, then to someone else who disagrees. The farmland on the outside was pulled off very well and looked really good, but sadly it could hardly be used because it was out of the way and the enemy would destroy it anyway, it was a nice creative touch though, that added to the overall feel of a historic map. The castle looked amazing, real or not, anything like this must of taken a ton of time and effort to make, and DoY does it to perfection. The Snake played the role of the enemy well, and you ended up loving to hate him. To me all these things award the 5. Absolutely perfect, the terrain gave the player the opportunity to customize their defenses, the farmland added a nice touch to an already stunning castle, and the castle itself, big, bad, and realistic. Many tricks like wooden crenelated walls and custom bridges and towers were used, also the castle had multiple keeps and an intricate interior design--pathing and such. Plenty of a history lesson for a historical map, with the extra touch of fantasy. It serves its purpose and kept me interested while reading. Wow, thank you for taking the time to play the scenario and write that excellent review! I am glad you enjoyed the map. A brilliant map, lots of fun :). I definately recommend downloading.